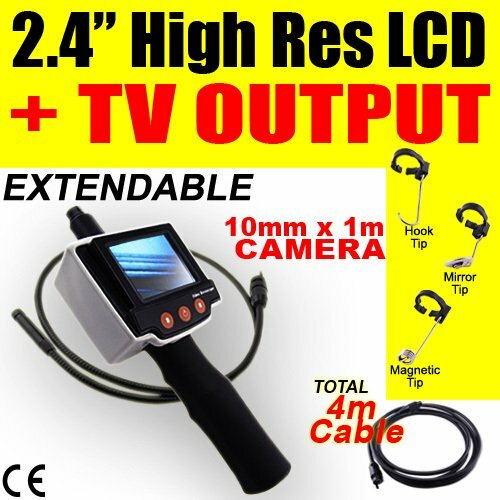 This 2.4" Color LCD TV Inspection Video Camera uses optoelectronic. It has 180° Image Rotation function on receiver allows you to adjust viewing orientation, connect to TV with provided Video Cable and 10mm head to get into smaller areas. Mechanics will love this tool because they can see inside the motor without the time-consuming disassemble. It can also be used to check wear on pinion gears. Building contractors and home inspectors will use this to look inside of walls. It has built-in 2 LED lights with Brightness control, glare-free close-up & wide range field of view. It has 1m (3.3ft) Flexible Waterproof standard cable plus 3M extension cable with 30M exploration distance total of 4M metal cable, all included in the set. These cables can be used to inspect an area even under water, gaps and holes. If 4 meters is not enough, you may buy our optional 3m (9.9ft) metal cable extension cable without comprising the quality of the images it can produced. Accessories such as mirror tip is included for viewing within 54° angle. Strong magnetic tip allows you to pick-up nuts, bolts and screws you may have dropped in inaccessible places. Easy clip on design for fast installation. Hook tip, J-shaped extension used to tug, pull or pick up small objects or wires.